101 Dalmations hình nền. 101 Dalmations wallpaper.. HD Wallpaper and background images in the Classic Disney club tagged: 101 dalmations disney animated film movie wallpaper. Awww,Little sweeties !! !I adore this Isis ! Thanks Berni, I just love those dalmations! very beautiful!awww look at the gorgeous puppies! !just adorable! Pongo and Perdita are my fav Disney characters. This is nice. Perdita has spot on collar. 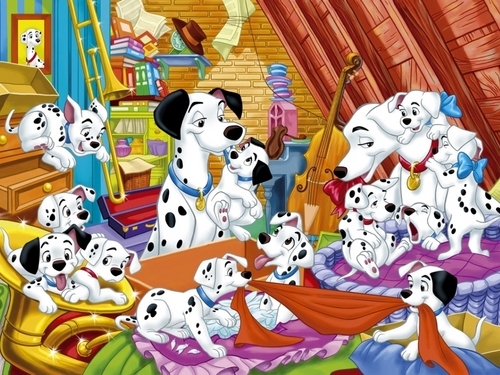 101 Dalmatians animated in the 60's Pongo and Perdita are my favourite Disney character. That's my favourite Disney movie. Pongo and Perdita with dalmatians spoty dogs are the mummy's and daddy's. Pongo and Perdita with owner Anita and Roger are both in the same marriage. Puppies been born in October Poor Perdita was giving the birth they all in the family.